1. Spanish shipwreck dated 1615 containing a suspected find of 19,000 gold coins, 6 gold bars and 15,000 silver coins and 25ozs of silver trinkets. 2. Spanish shipwreck I have found dated 1691 with a suspected find of 2,150 gold coins and 1,650 silver coins. 3. Spanish Galleon shipwreck dated 1699 with suspected 21,000ozs of gold and 25,000ozs of silver. 4. Spanish Treasure shipwreck dated 1715 with suspected 17,000ozs of gold and 21,000ozs of silver. 5. Spanish Galleon shipwreck dated 1723 with suspected 46,000ozs of gold and 14,000ozs of silver. 6. Spanish Galleon shipwreck dated 1731 with suspected 29,000ozs of gold and 9,000ozs of silver. 7. Spanish Shipwreck dated 1767 with suspected 85,000ozs of gold and 45,000ozs of silver. 8. Spanish shipwreck dated 1783 with suspected 36,000ozs of gold and 24,000ozs of silver. 9. Spanish shipwreck 1783 with suspected 18,000ozs of gold and 23,000ozs of silver. Hot spot Primary Gold location deposit – Queensland Australia = 170,000ozs, Western Australia = 170,000ozs, South Africa = 100,000ozs, Sudan approx 90 – 100,000ozs approx 6 grams per ton @ 29feet, Namibia = 100,000ozs 5/11 grams per ton @ 19/29 feet. Treasure - WW2 treasure southern Germany = between 10/12 feet 58oz Gold also 54 carats of diamonds buried 1945. Gold treasure @ 6/8 ft 470oz in Belgium 1944. Egypt = 13,500oz gold, 9,000oz of silver and 400 diamonds @ 21/24 ft. Egyptian treasure @ 21ft = 1,000oz gold, 2,600oz silver, also gold treasure @ 8ft = 95oz gold and 40 carats of diamonds, Egyptian treasure @21/23ft = 300oz, Egyptian treasure @ 25ft = 90oz. America, Alaska primary gold deposits @ 37/40 ft = 6grams per ton, 76,000oz, @ 37/40ft 6 grams per ton, 76,000oz. @ 7/9ft 70,000oz, @18/21ft 160,000oz. Britain – Celtic tribal treasure, gold 55,000oz @ 13/18ft buried nearly 2,000 years ago. King Johns lost baggage train, two locations, 240oz in site A, 150oz in site B. The Royal Charter shipwreck, 5 gold bars and 200oz of gold still to be recovered. Caribbean – Spanish ship wrecks, 163,000oz gold and 91,000oz of silver. The chart below indicates gold, platinum and diamond locations which are located remotely by Peter and are available as far as he is aware have not yet been found by anyone else so this would be a great opportunity for you to be one step ahead of your competitors. If you wish to know more about these locations please contact Peter by email or phone to discuss your requirements. If I do not find any gold, treasure or minerals in the area that you have requestsed me to search, as recompence for not finding anything for you I may be able to offer you up to three locations and out of these three locations you can choose one potential new location of your choosing. Once you have chosen your location I will then let you have the full information of that location you have chosen for free. These locations may not necessarily be in close proximity to the area I have searched for you. Are you interested in the history of Clogau gold mine? Click here to see more photos and extracts about the mine. Besides the hotspot locations which are on this website for gold, I have been working for a client over in Canada and another client in Turkey to locate gold. I asked them for a map of the mines so that I could do a map survey of the gold areas. They gave me a map of part of Clogau Gold Mine that they wanted me to check out. I picked up gold on the map within the John Hughes Load, lower level. I went back to the mine, discussed it with the Manager, check the records and that part of the mind face they had stopped work in 1907 because the geologist said that the rock formation was wrong and not the right rock to carry gold. After reading this we went inside the mine to check this area out. We got to the face of the load and I used my technique and yes the geologist was right, when looking at the rock formation it was not the right type of rock to carry the gold, however, my tools were reacting strongly beneath my feet and to the right of me. We did a small excavation to a depth of 2 feet and we found silver led which is always a good sign in this mine that gold would be present. We found the silver led at just a foot below our feet. A further foot deeper we hit the gold vein which then continued beneath the ground, beneath the floor beyond the face of the mine and averaged 5 grams per tonne of ore. This was very good when you bear in mind that Welsh gold is one of the rarest types of gold in the world and has a premium on it of three times greater price volume than the worlds gold which makes is very ulcerative to go for. 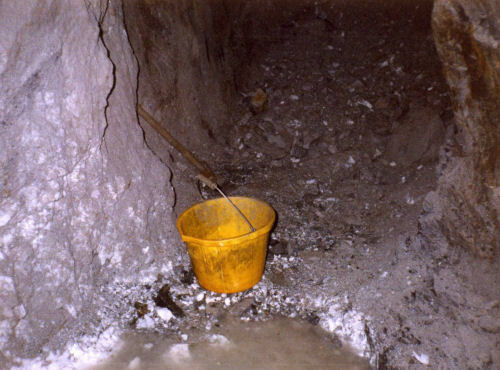 This gold deposit lasted the company for at least six months. I did receive a reference for this as you will see in my testimonials on this website. The second location in 1997 they asked me to find them another one and I had a look at a map of the upper level of the John Hughes system which was at a higher level in the strata close to the surface. I picked up gold by map surveying at a higher level, went to the mine, we went into the mind a got to the John Hughes level and went up vertical ladders lashed together to a height of 100 feet passing on the way several addicts (tunnels within tunnels) on the way up checking them for gold and they did not have anything of value until we reached the upper level. We took samples of rocks from the head of this addict within the tunnel and had the samples analysed and it was showing us 8 to 10 grams per ton. This is why I received another reference for that research that I carried out for them. Further investigations took place and unfortunately they could not go ahead as the cost to construct a safe passage to work the ore and release the load under the Health and Safety Rules would be too expensive. So again I was asked could I find another location and checking further maps of the St David's load which is part of the Clogau system, my finding indicated that the number 2 shaft at a given level would produce gold as regards volume. This is what I check out onsite and again got a reaction. Please bear in mind that it is not very high or wide inside the tunnels and you are restricted in how you perform with your tools. The minders started the process of drilling and digging out the area. I had given a guide on the depth and it turned out I was 6 feet out, which is not much when you are working in such a confined space. We hit a good sized 'gold pod'. We took out approximately 260 ounces in those days it was worth £1,000 per ounce. Unfortunately soon after this mine closed. What is a hot spot? A hotspot is a location which is heavily mineralised in for instance gold deposits. As an example, please look at the Google earth map showing a section of the Dolgellau gold belt. One is at St David's Load, the other one is at Gwyn, Gwynedd. Both of these locations are indicating hotspots and high quality yields of gold. The location at St David's my remote research is indicating that there is a fault running north east, south west carrying gold and copper mixture. A further breakdown would show in grams per ton the quantities recoverable from the ore. Regarding the other site location near Gwyn, Gwynedd you will see again an area marked out 'Gold hotspot location' and 'VG' indicating visible gold, a guide as regards the depth count to the top of the gold vein and in grams per ton approximately 4 grams per ton. This would of course be done in greater detail than what you see as this is only an example of what I am meaning by saying 'locations' and 'hotspots'. These locations can come right down to within a matter of a few feet of the actual load. This would be the remote side of the research. A site visit would then firm up the findings plus further sampling within the area. This will save your company thousands upon thousands of pounds also saving in time and costly expenditure such as size mix. And to employ my services to get these results would be far cheaper and just as accurate. For evidence and proof of what I say, please look at my references below. 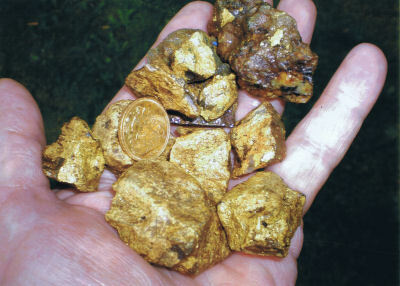 In 1996 and 1997 Peter was successful in locating several substantial gold deposits prior to the mine closing. Above are some photos from the site visit, and below you can view references for Peter. 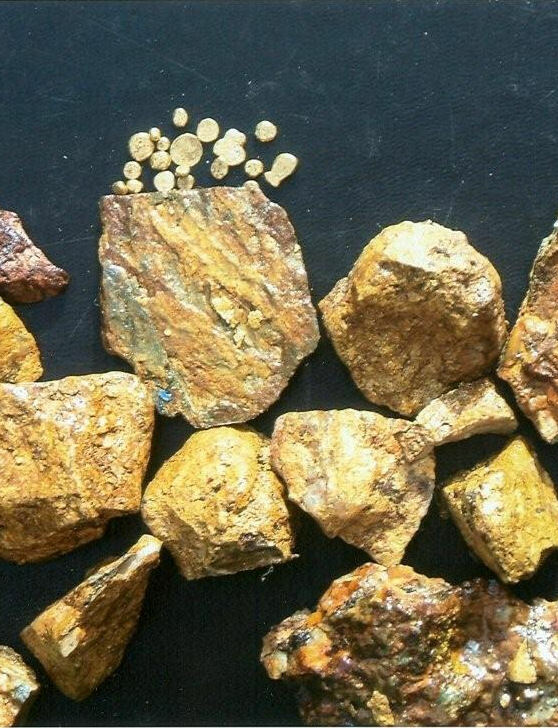 Some of my own gold ore and copper ore with gold in and gold bits I found by dowsing. Gold is difficult to find even for a dowser. Gold leaves images of itself as many as four can be around one piece of gold which means that the dowser can actually get a reaction and thinks its gold but in actual fact it is an image or a mirage of the actual gold which could be several feet away from the image which can confuse people and it takes a professional to know how to avoid the images which takes time and skill to learn. The skilled dowser learns to visualise the source he is looking for; that helps to reduce the amount of false images surrounding the actual gold. This is just one of many pitfalls which an amateur can come across. Before Peter went to Clogau Gold Mine he spent 3 1/2 years research and practicing before he was approached in 1996 by the Manager of Clogau who noticed him practicing his technique and invited him to the mine which then Peter spent 18 months going to Clogau Gold Mine on his days off from work plus map dowsing for the Company to gain practical experience and knowledge on site and understanding of the geology of potential gold fields. In return for this experience he was successful in finding three separate deposits of gold for the Company. Gold prospectors who need to help finding gold deposits may be interested to know that Peter is experienced in working alongside geologists to find deposits. One question that comes up a lot is "how do you dowse for gold". 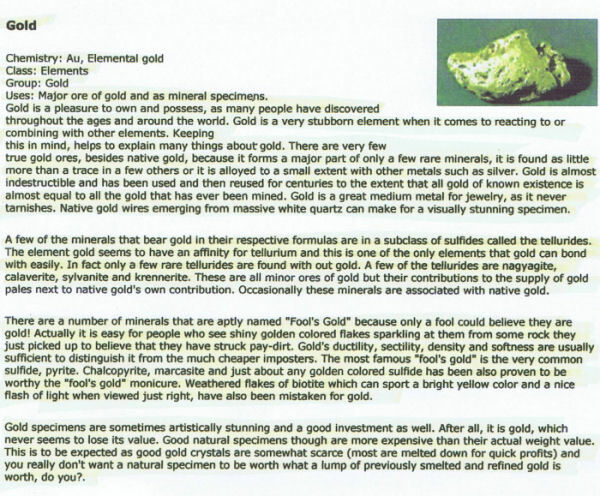 My answer to this question is like all subjects you have to study the subject in this case its gold so you read up on the natural gold such as alluvial gold and primary gold. Primary gold is the first stage. Alluvial gold is the second stage. In other words the primary gold was in the mountains first over millions of years and then the erosion took place over further millions of years when sediment in the rocks built up on top creating what is know as "alluvial gold" or "secondary gold". Primary gold is the gold within the rock formation in the quart veins and which has not been broken down. So you need to read everything on this subject and then visualise the natural gold then do experiments at home by using 8 bottles and putting in different minerals in each bottle and of course gold in one of the bottle. Black out the bottles so that you can't see what is in them, mix them all up, spread them out, then walk towards the containers. As you go over the containers the one with the gold should react but remember that gold leaves images of itself. You must learn to eliminate the images and concentrate solely on the container with gold. If you succeed with this then you can really go out and search for gold or you can map dowse for gold.